Immigrants from Grand Rapids, Kalamazoo, Sturgis, Ionia, Lansing, Detroit, and Ann Arbor participated in a rally on the steps of the Capitol following the arrival of the “Licenses for All pilgrimage" on Tuesday, October 9, 2018. Sylvia, who wishes to keep her last name off the record, has implants in her hips. 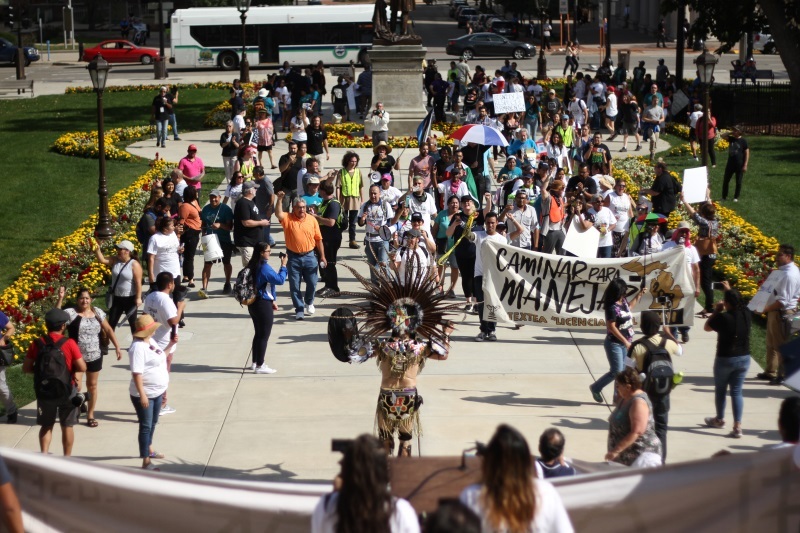 And yet from October 5-9, she walked over 65 miles from her home in Grand Rapids to the steps of the State Capitol in Lansing with others from Movimiento Cosecha to demand driver’s licenses for undocumented immigrants. Not only did she walk, she danced, chanted, and sang through the rain and through the pain. "A driver's license is very important for me, and for my children," said Sylvia. "I need to be able to take my children to school without fear." When Sylvia and the rest of the walkers arrived in Lansing on October 9, 2018 there were over two hundred immigrants, allies, community and faith leaders there to greet them, holding signs and banners. 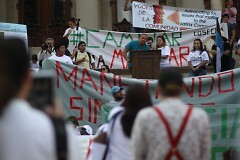 The arrival then turned into a rally at the steps of the State Capitol that demanded driver's licenses for all. The program featured testimonies from other walkers as well as speakers from Movimiento Cosecha Grand Rapids, Movimiento Cosecha Kalamazoo, Movimiento Cosecha Sturgis, Action of Greater Lansing, Detroit Hispanic Development Corporation, Michigan Immigrant Rights Center, and Joy Like a River sanctuary church in Grand Rapids. The rally was also attended by a dozen members of the Bronson Park Freedom Encampment, a community of people experiencing homelessness in Kalamazoo fighting for housing rights, who participated in all 5 days of the walk, as well as Kalamazoo Commissioner Shannon Sykes-Nehring. 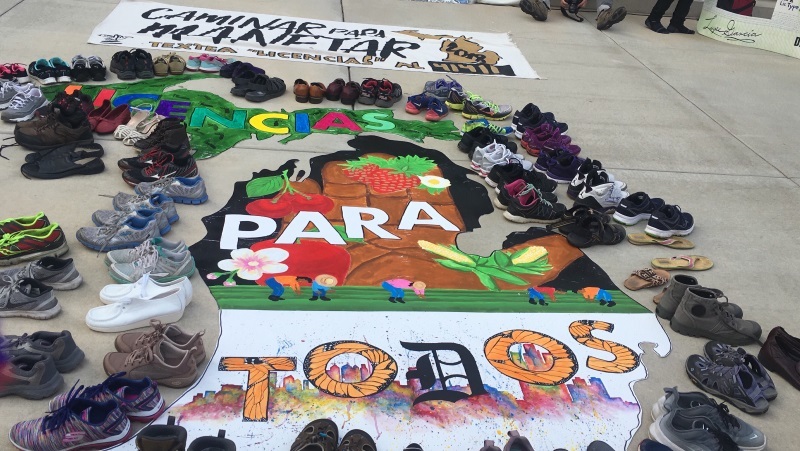 The Cosecha groups from around the state then each brought out a piece of a large decorated Michigan map to put together, as the groups are joining together to form this movement across the state. The walkers then surrounded the map with their shoes to represent their Pilgrimage across the state to fight for justice. Undocumented immigrants in Michigan have not been able to obtain or renew licenses since 2007. When undocumented immigrants are stopped by police for any reason, they may be detained for driving without a license, transferred to ICE detention, or even deported and permanently separated from their families. Today’s rally and the pilgrimage are part of a statewide “Licenses for All” campaign led by Cosecha Michigan, immigrants, allies, and other local organizations. The campaign specifically aims to activate immigrant communities throughout Michigan to fight for the right to drive without fear. “In the 10 years since I have been unable to renew my licenses, politicians in Lansing have repeatedly submitted state bills to give us back licenses. But nothing ever happens with these bills. Walking for five days from Grand Rapids to Lansing with my dad and rallying in the streets with immigrants from all over the state is giving me new hope. Our community has never united like this to fight for licenses before, and this is just the beginning. By walking and protesting, we are inspiring our community and growing our movement every day. When immigrants from every corner of the state are ready to take action together, then we will have the power to win,” said Ana Isabel, an organizer with Movimiento Cosecha GR and a participant in the pilgrimage.